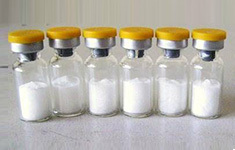 GHRP-2 also known as KP 102 is a commercially synthesized, growth hormone releasing hexapeptide. It is a super-analog of the GHRP-6 which is capable of potent stimulatory effect on growth hormone (GH) secretion with slight stimulator effect in PRL, ACTH and levels of cortisol). Purity: 99% (HPLC). 5mg per vial .